If you’ve ever found it daunting to browse the vast selection of wines at a specialty wine retail store or even in your local supermarket for the perfect bottle of wine for a specific occasion, you’re not alone – most people find it challenging as well. Where does one even begin? That kind of overwhelming choice – coupled with the general lack of information – is one of the reasons for the rise of e-commerce in the world of wines. Over the past months we’ve seen how the wine and spirits distributors, such as Magnum Spirits & Wines with their online commerce platform eWineGallery.com, begin to offer direct-to-consumer offerings online. Otherwise the wine merchants join the likes of WineFamily, which aggregates and houses different stores selling wine, Rakuten-style. But having a wide – and in most cases, far wider – selection online only creates the same problems encountered by off-premise retailers; how do consumers choose? 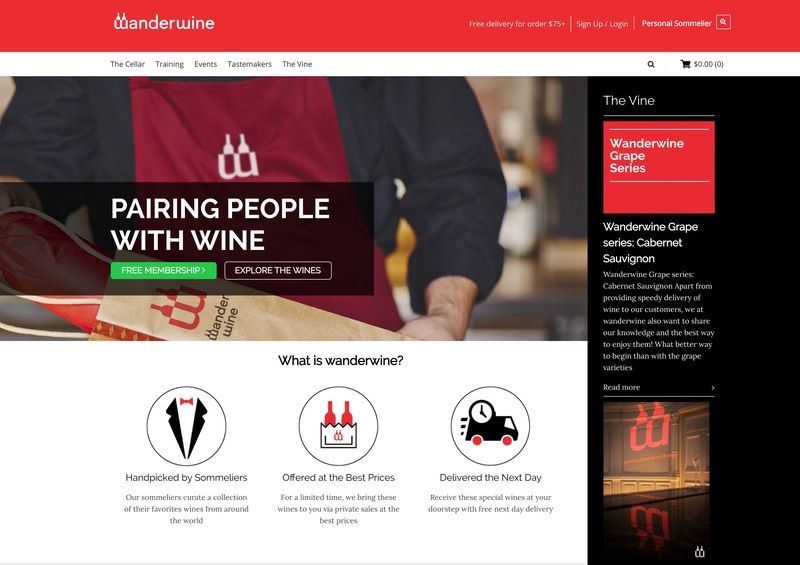 Here’s where some services innovate – newly-launched Wanderwine.com leverages on the expertise of three sommeliers, each of whom have their personal taste and preferences, to curate their online selection for an almost personalised wine-buying experience. wanderwine works with local wine tastemakers and sommeliers Gerald Lu of Praelum Wine Bistro (pictured), Salt Grill & Sky Bar’s World Gourmet Summit Sommelier of the Year 2015 Fazil Mohammad ,and Stephanie Rigourd of Hilton Singapore, to select quality wines to list on the site. Customers can search for wines according to categories such as wine type, country of origin, grape varietal and price. Each product page features extensive descriptions of the wine, tasting notes, and food-pairing recommendations for customers to better understand the wine and make a more informed choice in their selection. In that sense it’s similar to The French Cellar, which taps on the expertise of France-based Nicolas Rebut to select the wines. Not all who wander are lost. Some are just looking for the perfect bottle of wine. “We understand that it can be daunting for some when it comes to choosing wines. With wanderwine, we make it less intimidating for those who are not familiar with wines, yet introduce new and unique labels to seasoned wine drinkers. You have your own sommelier right on your desktop,” adds Gerald Lu, who was appointed Best Sommelier Singapore 2010.
wanderwine features wines from various regions including wines from France, Australia, New Zealand, Spain and Switzerland. Highlights from the cellar include the Two Hands “Bella’s Garden” Shiraz 2012, a full- bodied red from the South of Australia that is a reflection of what a top quality Barossa has to offer; Amigne de Vétroz, La Danse des Etoiles 2012, an expressive yet delicate white wine that pairs perfectly with smoked fish; and Cava Brut Reserva Agustí Torelló Mata, 2010, one of the finest and most elegant bubblies the world has ever tasted. wanderwin offers next-day delivery service, with an option to choose a delivery timeslot to receive their purchases. Delivery is complimentary for orders above S$75, or a delivery charge of S$16 applies.